"Helena and I stood pressed to each other, enraptured by the sight of the harbour and the Statue of Liberty suddenly emerging from the mist. Ah, there she was, the symbol of hope, of freedom, of opportunity! She held her torch to light the way to the free country, the asylum for the oppressed of all lands. We, too, Helena and I, would find a place in the generous heart of America. Our spirits were high, our eyes filled with tears." Goldman's romantic hopes were soon shattered by the dismal realities of working-class life. Settling first in Rochester, New York, she found factory work harder than in Russia, and joined in the growing militance against the inequality and inhuman working conditions that characterized industrializing America. The decisive moment came in 1886. Labor and radical activists held a mass rally in Chicago's Haymarket Square on the evening of May 4 to protest the police's brutal suppression of a strike at the McCormick Harvester Company against a union lock out the previous day. Towards the end of an otherwise peaceful demonstration, a bomb was thrown at police after they attempted to stop the meeting, injuring people in the crowd and killing a police officer. In the chaos that followed an unknown number of demonstrators were killed by the police, and another six police officers were fatally injured (primarily by their own gunfire), and died during the ensuing weeks, their condition avidly followed by the public. Afterwards, the police and the press blamed Chicago's anarchist leaders, and in this climate of hysteria a jury condemned them despite a dearth of evidence. Seven were sentenced to death, one was given fifteen years. Of those who received the death penalty two had their sentences commuted to life imprisonment, and another committed suicide the night before the execution. The remaining four were executed on the 11th of November 1887. Convinced of the defendants' innocence, the outraged Goldman became active in the anarchist cause. With the crystallization of Goldman's political thought came changes in her personal life. Refusing to be trapped in the unhappy marriage of her earliest years in America, Emma risked the stigma of divorce, leaving her husband in Rochester and heading for a new life in New York. It wasn't long before the young idealist became a prominent member of the city's anarchist community. Johann Most, the great anarchist orator, recognized Goldman's eloquence and commitment, and organized her first speaking tour. Amidst the newfound excitement of political activism, she fell in love with Alexander Berkman, a fellow Russian émigré. Together, they vowed to dedicate their lives to anarchism. 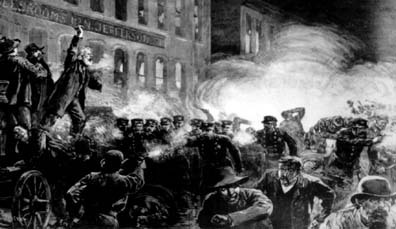 In 1892, when Henry Clay Frick of the Carnegie Steel Company provoked a bloody confrontation with workers at the company's plant in Homestead, Pennsylvania (June 30-July 6), Berkman and Goldman decided to retaliate. On July 23, Berkman went to Frick's office in downtown Pittsburgh and shot Frick, but failed to kill him. Berkman was convicted and sentenced to twenty-two years in prison. Though Goldman was involved in the plot, she escaped the indictment because of insufficient evidence. When President William McKinley was shot in 1901 by Leon Czolgosz, the police immediately tried to implicate Goldman, noting that Czolgosz had recently attended one of her lectures in Cleveland. Consequently Goldman and other anarchists were arrested. Eventually, though, disappointed by the lack of evidence against her, the authorities were forced to order Goldman's release. Goldman temporarily withdrew from public life to avoid harassment. When she re-emerged she entered one of her most politically active periods, speaking around the country, writing on a wide range of topics, and editing her free-spirited journal, Mother Earth from 1906 to 1917. Many, however, remained convinced that she was a dangerous killer, thanks in large part to the anti- anarchist agitation of the press. The Haymarket bombing, 1886. 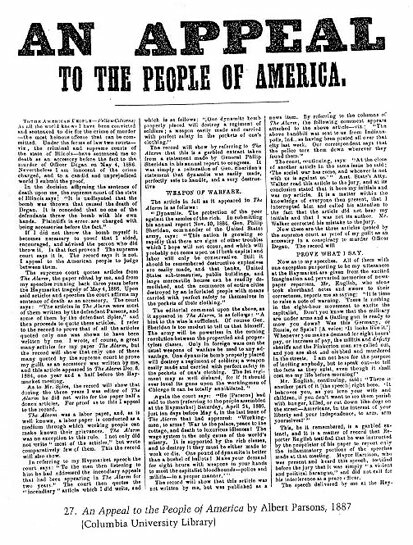 In the late nineteenth century, anarchist events were routinely distorted by a hostile American press. This wildly inaccurate portrayal of the Haymarket bombing appeared in Harper's Weekly. The illustration makes it appear as if the police were being fired upon. In fact, the last speaker was just finishing when police arrived to halt the meeting. The crowd was beginning to disperse before the bomb exploded, whereupon the police began firing indiscriminately into the crowd. Following the Haymarket bombing incident, Albert Parsons and several other anarchist leaders were arrested. Parsons, convinced of his innocence, had turned himself in on the day of the trial; the others had been arrested earlier. Despite the absence of evidence linking them to the bombing, they were convicted, and the trial became a cause cèlébre for the American Left. Emma Goldman admired their passionate commitment and believed they were innocent. The guilty verdict and the stirring defiance of the jailed leaders had an important influence on Goldman and inspired her initial interest in the American anarchist movement. Protest demonstrations flared across America and Europe. On November 11, 1887, Albert Parsons and three other anarchists were executed. The inscription on the four men's tomb echoed the final words of one of the victims: "The day will come when our silence will be more powerful than the voices you are throttling today." In 1893, Illinois Governor Peter Altgeld, convinced of the Haymarket defendants' innocence after a lengthy review of the trial, pardoned the anarchists who had received long prison sentences for their alleged role in the Haymarket bombing. This dramatic story accusing Emma Goldman of masterminding the attempted assassination of industrialist Henry Clay Frick was typical of those printed in many newspapers across the country. On September 6, 1901, Leon Czolgosz assassinated President McKinley. 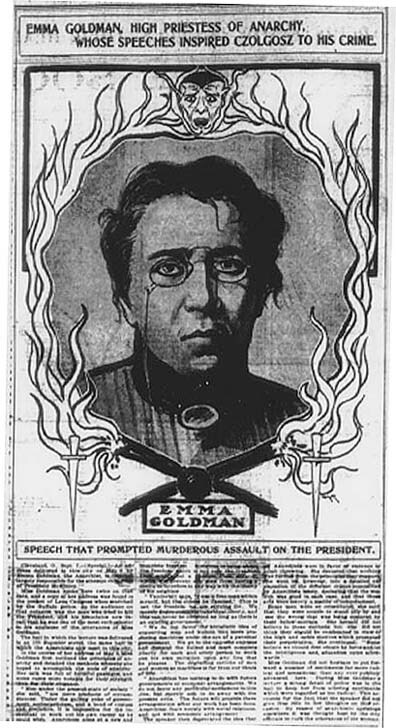 Although Emma Goldman did not know Czolgosz, police and the press blamed her for the President's death because Czolgosz had attended a speech of hers earlier in the year. This article, with its frightening illustration, is representative of the way in which the nation's press fueled the negative characterization of anarchists. Such notoriety forced Goldman to retreat somewhat from the public spotlight and to adopt the name "Miss E.G. Smith," which she would use intermittently over the next few years. Her strength of will, though, is reflected in her return to public lecturing in 1902. 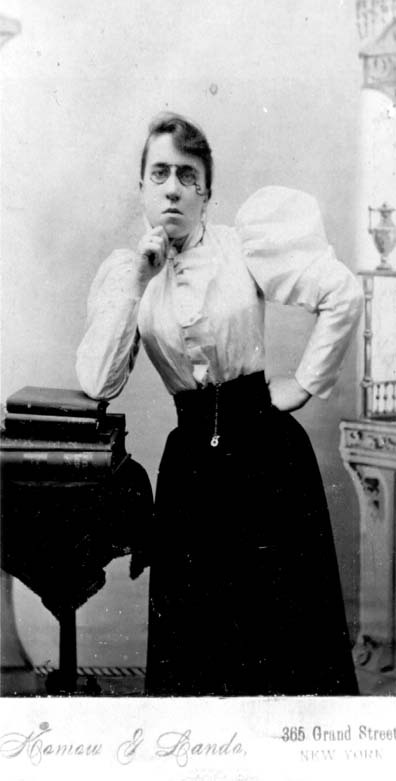 At the turn of the century, the young Emma Goldman stood out as one of very few women to assume a prominent place in the largely male-dominated milieu of labor and immigrant activists in New York City.